The 2015 Election Committee has completed the nomination and final candidate selection phase for the 2015 NAUI Board of Directors election and I am honored to be one of the 12 candidates listed on the official ballot standing for the 2015 election. I am asking for your VOTE as one of your Board of Directors. The election begins on November 2, 2015 and ends on November 30, 2015. I have had the pleasure of being a NAUI Instructor for over 40+ years and would consider it an honor to share my years of diving, teaching and business experience with you as a Member of the Board of Directors of NAUI Worldwide. I have always been passionate about scuba diving, teaching and business. Being able to combine them in my life’s work has been a dream come true. I started diving at age 15 in and around New England. As a young Navy Scuba Diver trained at the Naval School for Underwater Swimmers in Key West, I had the opportunity to dive the Arctic Circle, North Atlantic, Mediterranean and throughout the Bahamas and Caribbean aboard nuclear Submarines. While still on active duty, I completed my NAUI Instructor Course in Rockport, Massachusetts and started teaching scuba diving to military personnel stationed on isolated duty in the Caribbean and Mediterranean. Upon release from active duty I continued my passion for diving, teaching and business as a Member of the U.S. Naval Reserves Harbor Clearance Dive Team. I was trained and qualified as a Navy Deep Sea Diver (air and mixed gas), Hyperbaric Chamber Operator, Diving Supervisor and Hard Hat Diving Instructor. While majoring in Marketing at the University of Connecticut, I taught scuba diving classes at the University, became President of the UCONN Scuba Club, Directed the UCONN Underwater Symposium & Film Review and became a NAUI Course Director. During summer breaks I taught Navy Deep Sea Diving at Harbor Clearance Unit Two, Little Creek, Virginia. With a Bachelor’s Degree in Marketing from UCONN I became NAUI’s first Marketing Director. Introducing a Marketing Concept at NAUI HQ back then was one of the most challenging tasks I have ever undertaken. Two year later I helped start the Association of Diving Retailers and worked for California Skin Diving Schools as an Instructor, Divemaster and Store Manager. From 1985 to 1992 I was the owner of Undersea Showcase, a NAUI Pro Facility, and actively taught scuba classes at all levels. My post-retail industry experience broadened to include being the National Sales Manager at Action Plus Wetsuits, Product Manager at U.S. 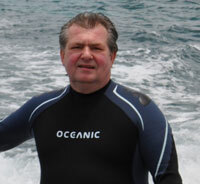 Divers / Aqualung, and Owner & President of Undersea Designs, a wetsuit manufacturer. I retired from the U.S. Naval Reserves in 1996 as Chief Diving Supervisor of Mobile Diving & Salvage One, DET 319. In 2001 I founded the Dive Industry Association, continued to manufacture wetsuits and worked as a Business Consultant for the Small Business Development Center in Oceanside, California. Upon our relocation to Houston, Texas I became a Senior Business Consultant at the University of Houston SBDC where I consulted with hundreds of small business entrepreneurs, taught Marketing and Business Planning and represented the University’s SBDC Program at Trade Shows and Business Meetings. It was because of my full time employment at the University of Houston that allowed me to represent the Dive Industry Association at weekend Trade and Consumer Shows across the country while being introduced to the finest business development tools in the nation. In 2004 I founded the Dive Industry Foundation, a 501c(3) non-profit, tax exempt, charitable organization and continued to build a professional consultancy firm. In 2012 the Dive Industry Association and the Dive Industry Foundation relocated to Melbourne, Florida, where we are very active in industry marketing and consulting to over 100 dive industry businesses. Today, The Dive Industry Association and the Dive Industry Foundation are both Sponsors of DIVE LOCAL, an industry co-op marketing campaign designed to promote local Dive Stores, Dive Boats, Dive Clubs and Instructors. The current NAUI BOD has identified Board Level Leadership Needs in three areas they consider weak in NAUI leadership and industry influence: 1) University level leadership. 2) Diving Industry Leadership. 3) Destination Diving Facility Ownership and Management. I believe that my lifetime of education, employment and experience has prepared me well to work effectively in all three areas where NAUI needs the most attention and growth. NAUI has made incredible progress in the past two years in regaining its legitimate role as an Industry Leader. The Board is looking for candidates that have diverse experience in the diving community to help regain market share at colleges and universities, retail dive centers and destination diving facilities. I would propose that we expand that idea and make sure that NAUI adopts a serious marketing program that reestablishes us as an Industry Leader. To only pursue market share and increased sales as isolated goals would be a mistake NAUI cannot afford to make. Increased sales and market share occur as a result of having the proper products, competitively priced, that the market is looking for. I believe we as an association are making daily progress on refining our programs and products and we need to expand that effort and give our Training Department the tools they need to accelerate the process. All of our programs and services need to reflect our commitment to excellence and higher standards. Good marketing is the key to educating our current, former and prospective Members about our Brand. NAUI has historically been weak in marketing and needs a clear, comprehensive marketing approach that will build our Association and result in better products and service, more professional and productive Members, and increased business accounts like Dive Centers, Destination Dive Operators and Resorts, Colleges and Universities, and Public Safety Dive Teams. As a Member of the Board of Directors I will work with our service centers to make sure they are implementing an integrated marketing approach that focuses on quality products, member acquisition and retention, superior customer service and effective advertising and promotion of the NAUI Brand. I support continuing education for all of our Members to give more qualified candidates access to Instructor Trainer and Course Director opportunities. To regain our Leadership in the Recreational Education Industry I will propose that we work closely with our Sales Force to train them as Business and Training Consultants and give them the education and tools they need to assist business members in their territory. As a NAUI Board Member, I promise to work with our current Board, our Service Center Staff and our Members to solicit comments and suggestions from our membership and actively communicate the work the Board is doing on their behalf. “In what specific area(s) of board governance do you believe your skills and experience will be especially helpful and what do you hope to contribute as a director?” As a Founding Director of several Corporations I have experience in adopting a framework of rules and practices by which a board of directors ensures accountability, fairness and transparency in a company’s relationships with all of its stakeholders. As an active Director on corporate boards, both for-profit and non-profit, I have had the experience using the mechanisms, relations and processes by which corporations are controlled and directed to balance the interests of a diversified group of stakeholders. I believe I can bring balance to our current Board while representing the diversity of our membership. “If elected to the NAUI BOD, what are your top three goals for NAUI?” The purpose of every business, both for-profit and not-for-profit is to sell a sufficient number of profitable products to a sufficient number of customers. Marketing is simply the application we use to bring buyers and sellers together in the hopes of facilitating a positive buying decision. Therefore, my three goals for NAUI would be to: 1) Ensure that NAUI’s programs and products are the highest quality possible and competitively priced in the industry. 2) Develop and implement plans to acquire, retain and reactivate NAUI Members. 3) Create, implement and refine an integrated Marketing Strategy to build the NAUI Brand. How will your goals help NAUI grow as a high-quality training organization in the scuba diving community?” By developing high quality training programs and products that reflect NAUI’s commitment to excellence our association will be known for quality products that are wanted, needed and have value to instructors in our industry. The words “quality” and “NAUI” will once again become synonymous in the diving community. Selling quality products attract professional instructors, universities, dive stores, and diving resorts, especially in areas like the Caribbean where NAUI is currently under represented. Implementing an integrated marketing strategy based on a quality product / quality customer relationship will help build the NAUI Brand, known for its quality products, professional members, excellent service and undisputed Industry Leadership. Bob Peck, NAUI 5967: I can’t express in words how excited I am to see Gene Muchanski as a candidate for the NAUI Board election. I have known Gene for many year’s and witnessed his commitment to excellence in diving instruction. I became a NAUI instructor at the University of Connecticut with Gene as ITC Course Director following later myself as an ITC Course Director and active NAUI instructor and dive shop owner. Please follow me and vote for Gene in this upcoming board election and make NAUI better tomorrow than it is today!